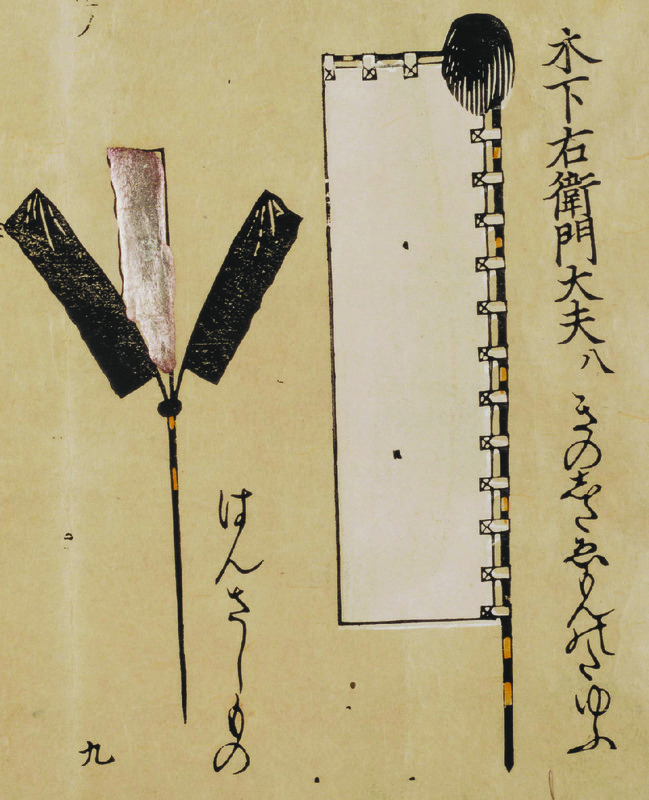 So, when I went to the Library of Congress last fall, I got to see physical copies of volumes 5 and 6 of O-umajirushi in person, which was very exciting. 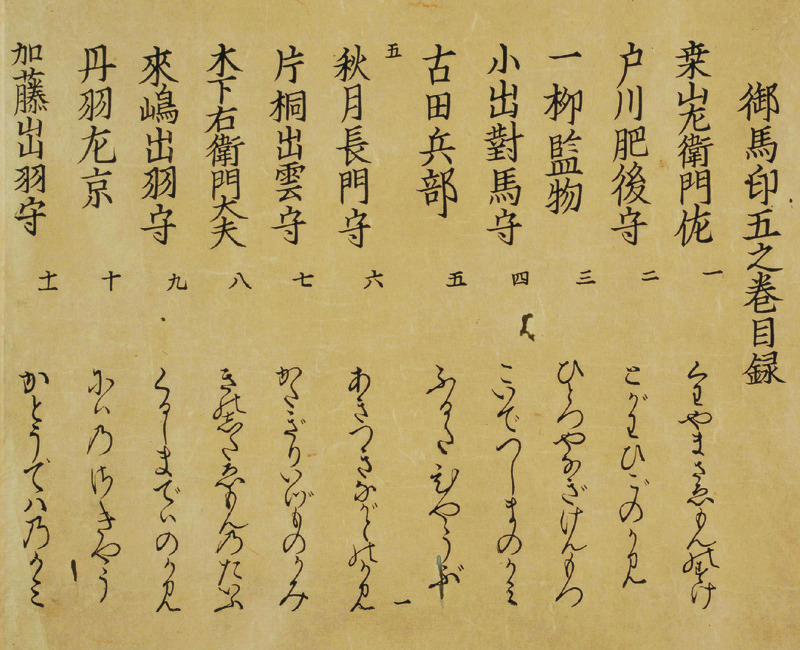 What was interesting, though, is that these copies had some differences from the copies from the National Diet Library which I used for my book. 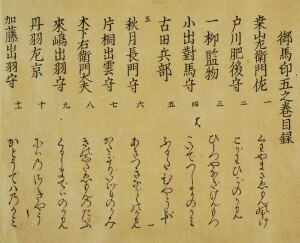 Notably, this version was in black and white with colors labeled in text, like the copy of Shoshō Kisei Zu I referred to. Other than that, they were largely the same, with the same contents and ordering and only minor differences to the depictions. 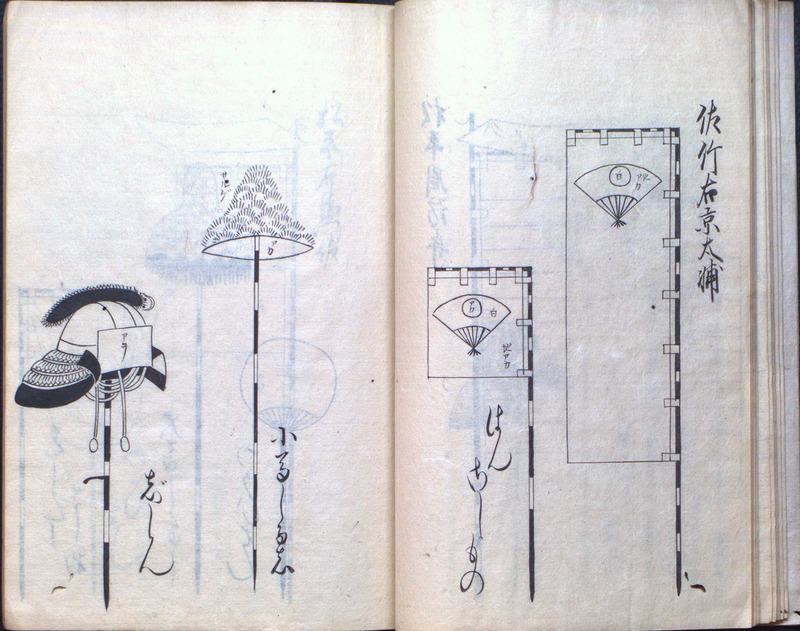 (The LoC version also had some insect and water damage.) However, in some cases it’s interesting to compare and look at some of these differences, and I’d like to talk about some examples. I’ll start with a few from volume 5, and do more in future posts. 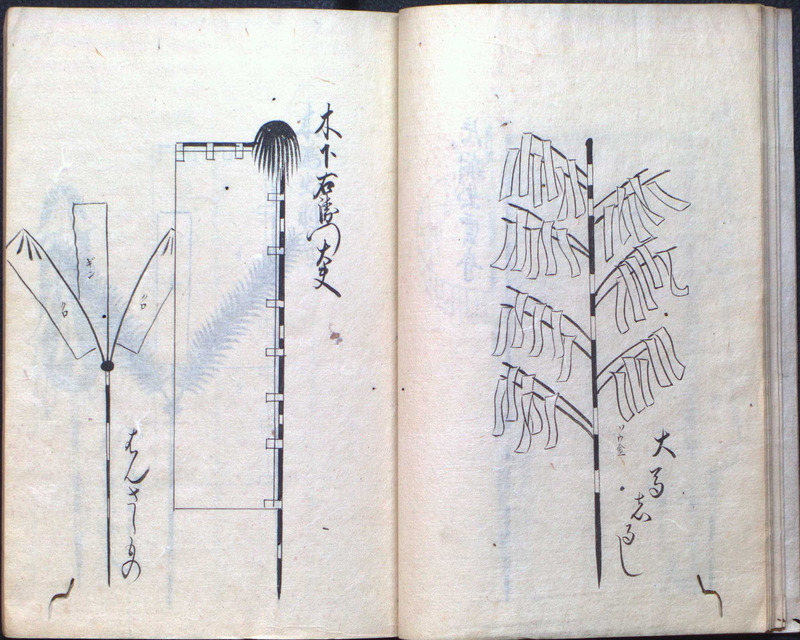 To the left is the table of contents of Volume 5 in the NDL copy, and to the right is the LoC version. 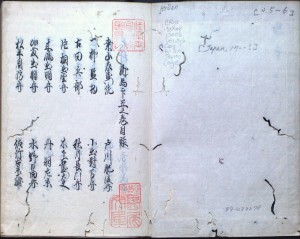 The LoC version is more compact and doesn’t include entry numbering or phonetic renditions of the names. 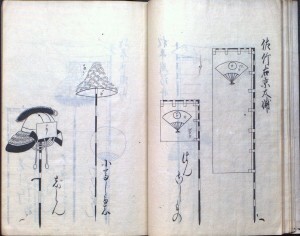 This page shows the close similarities of many of the drawings, down to such details as the position of individual paper streamers. 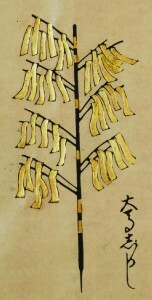 The labels follow the style of the table of contents. 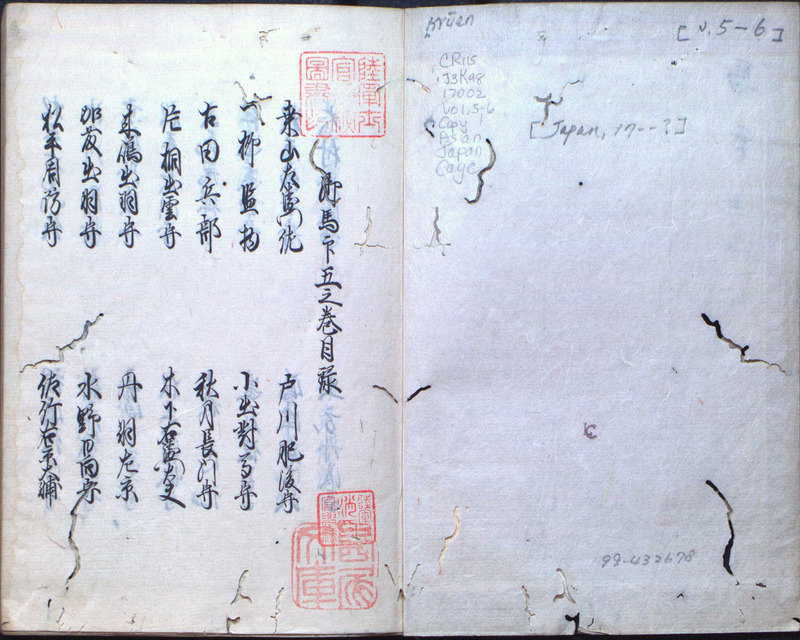 Because the LoC copy is folded into a bound book instead of a scroll, the two pages shown here are each half of different “pages” in the NDL scroll version. 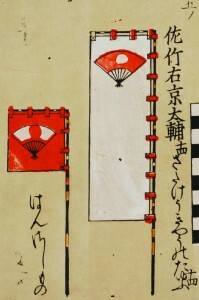 In the LoC version, the banners on the left are labeled クロ (kuro; “black”) and ギン (gin; “silver”), and the streamers on the right are labeled ソウ金 (sō kin, “all gold”), all matching the colored version. 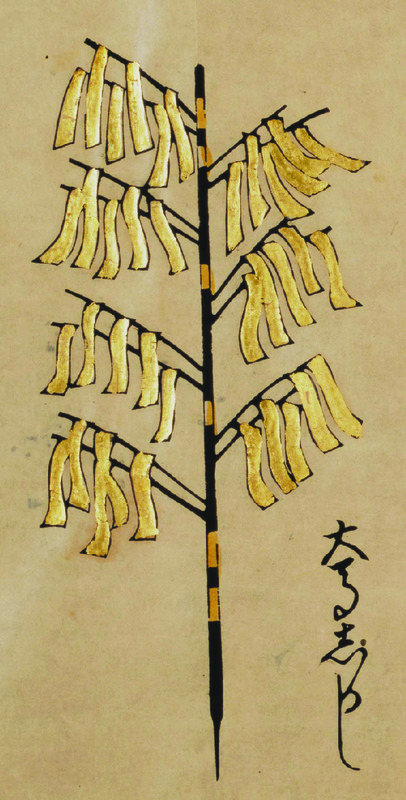 Worm damage is visible in the lower corners. 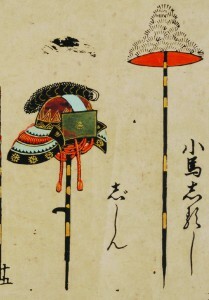 Here, while much of the color details of the helmet on the left are unspecified, the front piece is specifically labeled アヲ (ao, “green or blue”), showing that that in particular was important for identification. 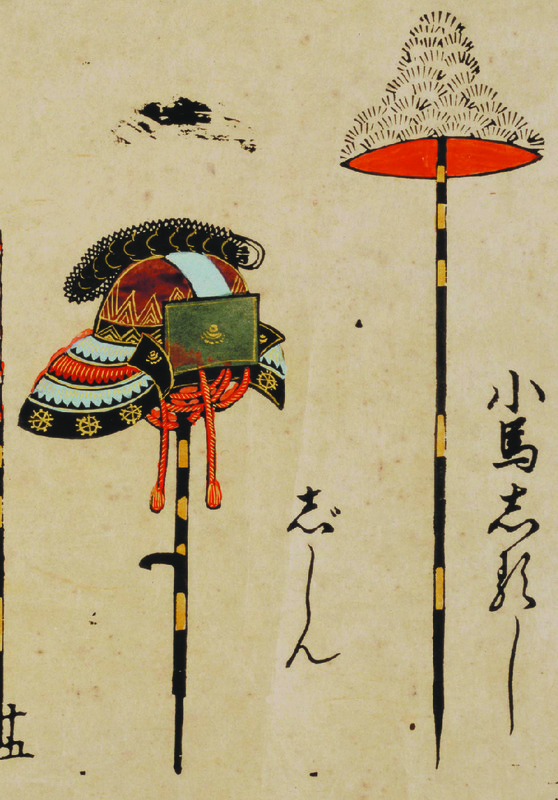 Like Shoshō Kisei Zu does, the LoC text specifies that the hat shape is covered in サルゲ (saruge, “monkey fur”), but for color only notes the red of the inside. 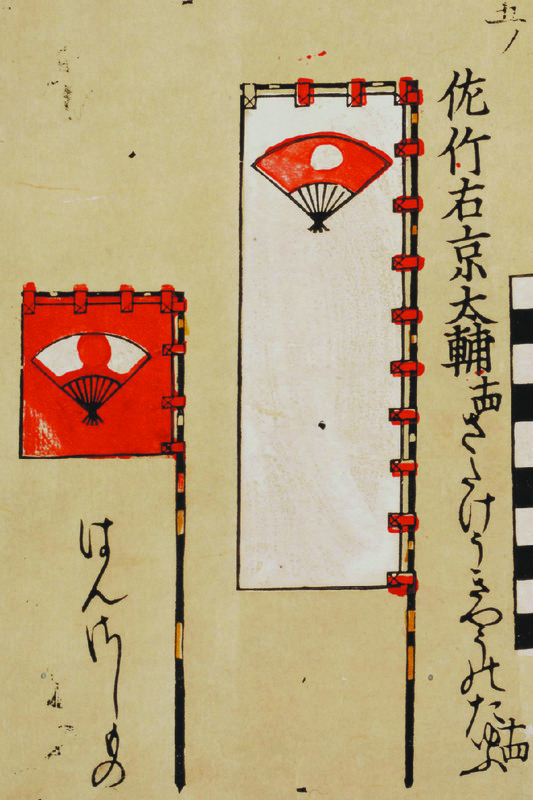 For the banners with the three-color fan mon on the right 地アカ (ji aka, “ground red”) is used both to describe the red background of the left banner and of the right fan, showing that the backgrounds of banners and fans were considered similarly. That’s all for tonight. Until next time! This entry was posted by Kihō on June 25, 2016 (a Senshō (先勝)) at 12:13 am, and is filled under Mon. Follow any responses to this post through RSS 2.0. You can leave a response or trackback from your own site.